Long ago, centuries before Dimli was born, the Bastion of Dwarvenhold and its sister city of Greyport were lost in a single blow struck by an ancient black dragon. The Five Clans of Dwarvenhold were scattered, and became refugees seeking the aid from clans and cousins across the land. Each of the five clans of Dwarvenhold had a task. One clan grew crops, brewed spirits, prepared feasts, and saw to the health of the dwarves of Dwarvenhold. The second mined the earth and were the architects of wondrous structures both within and upon the mountains and cliffs. The third were artisans, skilled in their trades, who brought the city wealth and culture. They worked the ores and precious stones that were excavated from the depths and the fine woods harvested from the lowlands. The fourth clan was the clan of the king, peacekeepers within the bastion’s gates; among them were the priesthood. They were the fair and just mediators for the clans. The fifth clan, Dimli’s ancestors, were the guardians. They had the honor and the responsibility of safeguarding the bastion from enemies beyond their walls. Dimli’s great-grandfather, Growlin, was master of the watch when the ancient wyrm reared its twisted and desiccated head. Before that invasion, the walls of Dwarvenhold had stood for centuries. In all that time, no foe, mundane or mythic had ever pierced the defenses of the five clans. Growlin’s defeat at the claws of that great dragon cast a black mark on his clan-name. Such failures are not soon forgotten among the dwarves. Even so, it may have been possible for the Guardians to one day restore the honor of their clan. It was rumored that Growlin himself must have been in league with the enemy, for it was believed that no foe, not even a dragon, could take Dwarvenhold by force! Because of this, Growlin’s name became a curse among the other four clans, and the dwarves who admitted to being kin of Growlin were outcast. Most dwarves swore that the clan of the Guardians would bear the shame of betrayal until the end of days. Under this cloud of disapproval, many of Growlin’s clansmen forsook their clan-name and lineage, and were scattered across the land. It was better to be clanless than clan-shamed. Dimli was raised in a small human village far away from Dwarvenhold. His grandfather, father, and mother were smiths, sharpening plows and shoeing horses for the farmers. They never asked for more than a fair price, and their craftsmanship was exceptional. The family of dwarves were appreciated for their trade and became welcome members of the community. They raised Dimli with the knowledge that hard work earns its own respect, and that he should feel no shame so long as he believed in what he did. They also taught him pride, sharing stories of his ancestors, the great battles they fought, and the feats of valor and honor that the heroes of his clan had accomplished. Yet these were never stories about any individual dwarf standing against countless odds. Every king had the strength of arm given by his warriors and berserkers. Every dwarf had an axe forged by a smith. Every smith used steel dug from the mines. Every miner had his belly and mug filled by a farmer. And every farmer was protected by the king and his army. While Dimli’s ancestral kin were the edge of the axe against the enemies of Dwarvenhold, the Five Clans together were the weight behind the blow. Growlin’s jeweled helmet, the only artifact that the family had to remind them of the old times, to would sparkle in Dimli’s hands as he listened to great tales of bygone days..
Like his father and mother before him, Dimli did not forsake his clan-name, and in his travels he was sometimes forced to defend himself because of it. He was worse than a clanless dwarf, he was a clan-shamed dwarf. Others who held to dwarven customs would turn him away. He had no cousins or relations he could call upon for help, or trust in an emergency. He had only his aging family and his own tenacity to rely upon. Dimli learned how to fight his own battles, watch his surroundings with a critical eye and read his allies with caution. He was always prepared for the worst, and he often faced it. His life on the road was not always a struggle. In his travels he met many honorable masters and tradesmen, some of whom would become his friends. 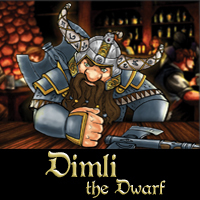 Dimli apprenticed to brewers, farmers, smiths, and countless other professions. He would throw himself into work when he had it, and made sure he earned his keep. He knew there would be no handouts for clan-shamed dwarves, and would refuse on principle any riches which he did not feel he had earned. He traveled and worked for years, earning wages when he could, settling for food, shelter and experience where he couldn’t. Eventually, Dimli’s travels brought him back to lands of this ancestors, to the foot of the mountains that had once burned with black dragon fire centuries ago, to the once-great city of Greyport. A new dragon had begun to terrorize the mountainside. Ancient and red, it had toppled the Temple of Greyport and sealed away the Mage’s Collegium decades ago, but as the crimson wyrm’s seasonal attacks had seemed to wane in recent years, a new order had been established in the city. Rogues, thieves, and more unsavory types had found the ruined city and its cavernous catacombs and sewers to their liking. The rabble of Greyport had all but forgotten about Dwarvenhold, and the countless adventurers who sought its wealth over the long years returned empty-handed, or not at all. Dimli never believed that Growlin had betrayed his kin. He always dreamed that he would be the one to find Dwarvenhold and to find out what really happened there in the last days. He wanted to be the one to restore the honor of his clan. In truth, that was what he had been preparing for all his life. Dimli spent all the coin he had been able to save on adventuring equipment. He encased himself in thick steel plate and armed himself with the finest axes he could afford. With the little bit of funds left, he acquired sturdy boots and strong rope. With Growlin’s helmet on his brow, he struck out into the mountains, searching for his homeland. He struck out alone, for who would accompany a clan-shamed dwarf on his mad quest to find Dwarvenhold? Besides, there was still that red dragon still rumored to live in the mountains. Before he set off in search of Dwarvenhold, Dimli spent weeks trying to learn what he could about the once-well-traveled paths through the mountains that would lead him to the massive gates of Dwarvenhold… if they still stood at all after the centuries. Unfortunately, Dimli could find none who knew more than rumor. Time and again, Dimli ventured into the mountains for weeks or months at a time. And time and again he returned to Greyport empty-handed. Years passed. Dimli persisted. Those who knew of Dimli’s ventures into the mountains thought them to be a fool’s errand at best. Dimli was no fool. He knew that his quest was all but hopeless… somehow, though, he did not lose faith. When the seasons turned cold, the dwarf would spend months in Greyport. When he was not researching history, he was earning what he could as a sell-axe and adventurer, or by fighting in the pits for the entertainment of others. He was not proud of this work, but it meant that once the ice thawed he could once again strike out into the mountains with renewed vigor and new equipment. It was after one of his many failed, lonely quests into the mountains that Dimli found himself back in Greyport. A trio of brothers were on a quest to recover an artifact for the elves of the north, and had need of a capable warrior. Dimli decided to go see what exactly the job was about.